Click the button below to add the Instructions for Use Paillard Bolex Model H 8mm & 16mm Movie Cameras - Free Download to your wish list. This 24 page booklet measures 4½ x 6½ inches, contains fifteen illustrations, and covers topics such as loading and unloading the camera, film transport, lenses, upkeep. 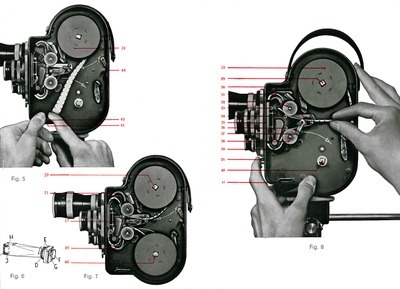 The spring-wound, clockwork motor driven H series Bolex cameras accepted 100ft spools of daylight loading film. 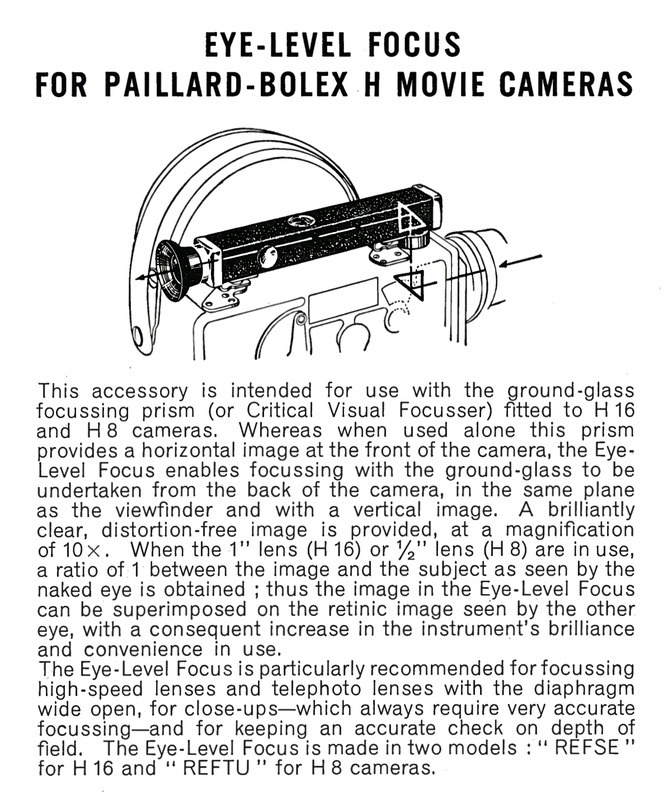 On non-reflex cameras, sighting and framing of the subject was accomplished with a parallax corrected viewfinder attached to the film chamber door. Reflex cameras featured through-the-lens viewing and focusing with a beam-splitting prism that diverted light into the viewfinder. This accessory is intended for use with the ground-glass focussing prism (or Critical Visual Focusser) fitted to H16 and H8 cameras. Whereas when used alone this prism provides a horizontal image at the front of the camera, the EyeLevel Focus enables focussing with the ground-glass to be undertaken from the back of the camera, in the same plane as the viewfinder and with a vertical image. A brilliantly clear, distortion-free image is provided, at a magnification of 10x. When the 1" lens (H16) or ½" lens (H 8) are in use, a ratio of 1 between the image and the subject as seen by the naked eye is obtained; thus the image in the Eye-Level Focus can be superimposed on the retinic image seen by the other eye, with a consequent increase in the instrument's brilliance and convenience in use. The Eye-Level Focus is particularly recommended for focussing high-speed lenses and telephoto lenses with the diaphragm wide open, for close-ups—which always require very accurate focussing—and for keeping an accurate check on depth of field. The Eye-Level Focus is made in two models: "REFSE" for H 16 and "REFTU" for H 8 cameras.